With our bags all packed, my family and I drove to Mala ramp to meet the boat and begin the swim. When we arrived, they were just lowering the boat into the water and I put on sunscreen and grease while they got everything else situated. My sister Jenna took the time to exclaim, “Abby, I am so glad I get to come with you on this swim, but f**k you for making me wake up at 5:00am.”I had a quick talk with the boat captain, Justine, and told her that I prefer to swim along side of the boat rather than following behind. next thing I knew, I was standing on the beach beside the ramp and slipped into the water to begin my swim. I swam past the harbor entrance and kept sighting the boat to swim up along side it. I swam over a few turtles and imagined that they were wishing me good luck on my swim. For the first half hour, I played catchup with the boat, and it seemed like every time I got remotely close, the boat would speed away from me again. At the first feed, I asked the captain if she could slow down and let me swim beside her and after that I was much happier. During the second half hour, my stroke started to stretch out and the conditions were relatively calm. I periodically felt mild jellyfish stings and I joked to myself that this was the ocean taking revenge for the very few I experienced in the English Channel. Up until around 1.5 hours, I could clearly see the bottom beneath me and then suddenly I was far enough out and all I could see was blue. For the next 2 hours, my stroke remained steady and I was pulling good water and feeling great. At the 2.5 hour feed, my mom told me that I was halfway to Lanai and I kept swimming strong with music playing in my head. The 3 hour feed came far more quickly than I expected and I was told I had already covered 6 miles and was on pace for a 4.5 hour swim. I continued to swim for about 10 minutes, staring into the blue and humming to myself when I noticed a largish grey shape swimming by far below me. I blinked a few times to make sure I wasn’t seeing things, my heart racing as the shark cruised by. I quickly swam to the boat and told them that I saw a shark, my heart pounding in my ears. Justine called me over to the side of the boat and told me to look around and see if I still saw it and asked me if I wanted to get out and end the swim. I didn’t see anymore signs of the shark and opted to keep swimming, with the team on the boat on full alert looking for fins. I started thinking that if I was still making no progress when I hit 6 hours, I would consider calling the swim. This, in part, helped motivate me to dig a little deeper and I began to pull a bit more water with each stroke. At the 5.5 hour feed, my parents told me that I was making good progress again and had less than 3 miles left to go! I kept pushing forward and I could finally tell that I was getting closer to Lanai. I thought about all the swimmers who inspire me. I thought about my training buddies Rebecca and Gino and how I knew they were cheering me on. I thought about Lynne Cox and how she pushed through much rougher conditions than I was facing. I thought about my friend and teammate, Paige, pushing me forward. All these people helped me get through the rough parts of this swim. With every breath to my left, I saw this little green fish painted on the side of the boat and imagined it cheering me on. At the 6 hour feed, I was told that I had less than 2 miles to go and I pushed on. As the swim got longer, I kept reminding myself that if I chose to get out, I would have to come back and do it all over again and this helped me stay motivated. At the 6.5 hour feed, I could see that I was really close and I asked if there was a particular landing spot I should aim for. Justine responded, “just get to shore!” And I turned to swim straight into shore. I left the boat behind and swam over a reef. The water got shallower and warmer and in front of me I could see waves crashing over another reef. I carefully swam over the break and found myself in a shallow rocky area. I picked my way over the rocks and finally cleared the water and turned to face the channel that I had just crossed. Most marathon swims are really a team effort, but this swim in particular would not have been successful without my parents, my sister, the amazing boat crew, and all the people (near and far) sending me their support. This swim was far tougher than I expected it to be and certainly tested my mental toughness. I am so grateful to everyone who cheered me on and glad that I was able to accomplish this goal. This entry was posted in Uncategorized on May 31, 2018 by abbygirlrose. I will be swimming tomorrow! My family and I arrived in Maui yesterday afternoon and have been settling into our hotel, while awaiting news from our boat captain, Justine, that the conditions look promising to swim. We received a call this morning that tomorrow promises the best weather of the week. The lead up to this swim feels so much more relaxed than when I was in England and so different since the weather is less changeable. I am so excited to begin my swim! In around 12 hours, I will begin my swim on the coast of Maui and head over to Lanai. Although I had originally planned to swim the other direction, Justine believes their are more benefits to starting on Maui and I am trusting her expertise. Besides, I think it is kind of exciting to swim from a place I know well (maui) to a place I have never been (Lanai). In the same way that my Catalina swim was special because I had spent my childhood staring out at the island, this swim is special because Maui is one of my favorite places in the world. The swim is about 9 miles and I hoping to finish within 5 hours, but the water is fairly warm (around 77 degrees) so I am not worried about getting cold. You can follow my progress here. This swim is important as I look ahead to the rest of my summer and will be both a milestone and a training opportunity. In July, I will be completing a 28-mile circumnavigation of Manhattan and this swim in addition to the rest of my training will help prepare for that swim. For now, I am off to bed to prepare to swim between two islands! This entry was posted in Uncategorized on May 29, 2018 by abbygirlrose. In preparation for my upcoming Maui Channel swim, I have been doing plenty of pool training, but have had little access to open water. Yesterday I went for a 3-hour training swim to remind my body and mind what long swimming feels like. My former club teammate, Serafina, escorted me on her paddle board and we made our way from Marina Del Rey to Santa Monica. The water was colder than I expected it to be and I initially had a difficult time finding any rhythm in my stroke. Because the current was pushing north pretty strongly, we had decided to turn around slightly before halfway to give ourselves enough time to return. As we rounded the Venice pier, my stroke began to smooth out and remembered why I enjoy ocean swimming. I was flying across the water, with the current pushing me steadily north. I didn’t see any dolphins, but I could hear their songs surrounding me in the grey water. Serafina signaled that we had been swimming for an hour and I stretched out on my back for a few seconds. Two dolphins passed us by on the outside and Serafina told me she had seen several more earlier in the swim. I was still feeling a little chilly at this point and we decided to swim north for 10 more minutes before turning back against the current. We turned south and I definitely noticed that I was no longer feeling the current giving me a push and instead fought against it with each stroke. We passed the Venice breakwater and stopped to check in for a minute, as the swell was getting larger. We swam back around the Venice pier and made surprisingly good time, even with the current against us. At this point it was clear to me that we would get back to our starting point before the 3-hour mark and would have to swim around a little to fill up the rest of the time. We reached the jetty and swam north again for 10 minutes and back to the jetty to finish the swim. Even though this swim was *only* 3 hours and I have done many swims that are a lot longer, this swim felt very long. In hindsight, this was due to a combination of forgetting to bring food, unexpectedly cold water, and that this was my first long swim of the season. Overall, this was a successful swim and I am grateful to Serafina for meeting me on a random weekday to make this swim happen! This entry was posted in Uncategorized on May 26, 2018 by abbygirlrose. One of my goals for my last week at Smith is to explore the local area, which is sadly something I’ve done a rather bad job of throughout my years at Smith. My friend Eva helped me on this quest by introducing me to a beautiful lake about 30 minutes away from Smith in the town of Ashfield. The drive out to Ashfield wound through the beautiful Western Massachusetts countryside and we arrived at the lake under a clear blue sky with a little bit of wind. We weren’t quite sure how cold the water would be so Eva brought us both wetsuits, just in case I wanted to wear one. One of the masters swimmers I swim with sometimes had told me that Ashfield had been hovering around 52 degrees, so I was a little nervous about the water being too cold for me to muscle without a wetsuit. I decided to wait until I felt the water to make a decision; my dislike of swimming in wetsuits fighting my desire to not freeze. When we got to the lake the air was around 60 degrees with some wind but the water felt warmer than I expected, maybe around 58 and I decided to give it a go without a wetsuit. We waded into the lake and agreed to check in with each other often but also said that we didn’t have to stay super close to one another, as the lake was empty. We swam straight across the lake and tread water for a little break at the other end. It was so good to be back in open water, and I felt like I was flying across the lake. We turned and swam back to our starting place and decided to take a second lap. On the second lap the wind picked up and I thoroughly enjoyed swimming into the chop on the way there and flying with the wind at my back on the return. Eva is training for a half Ironman and we paced each other well across the lake. I counted my strokes for one length and decided that each round trip was roughly equivalent to 1000 yards. I took one more lap because I was still enjoying the cool water and wanted to take full advantage of the visit to the lake. I wish I’d had a thermometer to take the water temperature because it really felt cool rather than cold and after 3000 yards my hands and feet weren’t numb and my fingers had not yet started to claw. I cannot believe that I have been at Smith for 4 years without discovering this amazing open water swimming location. I am so grateful to Eva for taking me on this adventure and braving the cold water with me! This short excursion back into open water certainly has made me excited for the many swimming opportunities that this summer will surely hold. This entry was posted in Uncategorized on May 12, 2018 by abbygirlrose. I am so sorry that I have been out of the loop for a little while, finishing up my undergraduate career at Smith College. 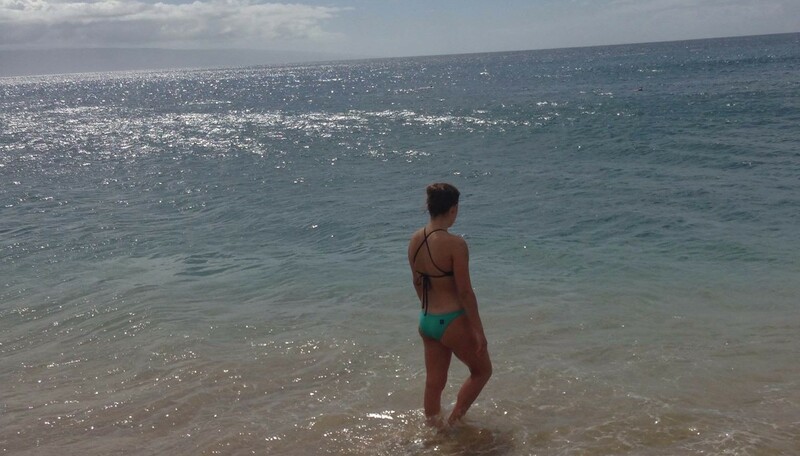 After I graduate in a few weeks, my family and I will be heading to Maui for vacation and I will get to do a swim that I have dreamt about since I first visited the island. I plan to swim the Auau channel from the island of Lanai back to Maui sometime between May 29th and June 1st. This swim has a straight line distance of 8.8 miles and has been completed by around 150 people since 2000 and several more before that. Although this swim is shorter than many of the marathon swims that I have been training for recently, it also presents new challenges, including warm water and wildlife. The water temperature between these two islands hovers in the high 70s, which is similar to the temperature of many competitive swimming pools. I have never done an ocean swim in water this warm and am excited to discover the unique challenges this will present! I have been training almost exclusively in the pool at the moment as I am still in Massachusetts, but my training has been going well and I hope to get an at least one ocean training swim completed when I am in California before heading to Maui. I don’t have a date set for the swim yet because my boat captain prefers to watch the weather and decide on a date once we are on the island! I will update this blog once I have more details but you will be able to follow my swim at track.rs/abby. This entry was posted in Uncategorized on May 9, 2018 by abbygirlrose. Yesterday I swam in the Pacific Ocean for the first time since leaving for school in August. Upon arriving at the beach, I was equal parts excited to be in open water again and nervous for how I would react to the cold water, which is sitting around 59 degrees right now. I met up with two fellow swimmers, Gino and Karl, at 7:45am for toes in at 8am and we agreed to aim for an hour swim, just to see how we would fare in the cold water. In the back of my mind was also the knowledge that around this time last year (on December 27th to be precise), I completed my 6 hour 60 degree English Channel qualifier. For this swim, the water was the clearest I’ve ever seen in Santa Monica, with about 8 feet of visibility. We swam south towards the Venice Pier and I felt my hands and feet tingle in the cold water, but I was also feeling warmer than I expected and I was flying through the clear water. We swam for 30 minutes heading south and then turned back north to get back to our starting point. As we got close to the end of the hour, I did start to feel a little cold, but as long as I was moving I stayed warm enough. Around this time in a cold-water swim, I reach a point where my skin is cold but I am creating enough heat to keep my core warm and it is a really cool sensation to feel like my body is the same temperature as the surrounding water. At these moments, I feel like I could just disappear into the water. When the tower marking our starting point came into view, I was glad to be done and ready to get out of the cold water. This short one-hour swim felt a lot longer than I expected, probably because I am used to training for shorter distances in a pool right now. The juxtaposition of this one-hour swim with the anniversary of my 6-hour qualifier brings forward the question of whether the goals we set can also sometimes become limiting factors for our performance. Said a different way, why is it that when I set the goal of swimming for one-hour does one hour feel like the longest I can do, but when I set the goal of swimming for multiple hours this arguably feels as long as the one-hour duration. Does this mean that psychological factors are telling me when I am “done” more so than physiological ones? For me at least, goal setting and goal sharing is a necessary part of achieving success in any athletic endeavor. I need concrete outcomes to hold myself to, and I like to share these with others so that positive peer pressure will also help hold me to my commitments; knowing my training buddies will be at the pool is sometimes the one thing that gets met to trek through the snow to the pool in the morning. What does it mean for goal setting if our goals also hold us back? This entry was posted in Uncategorized on December 28, 2017 by abbygirlrose. To celebrate thanksgiving this year I decided to check out a new open water spot that overcomes an unusual setting to provide an unparalleled swim experience. The group is Lucky’s Lake Swim at Lake Cane in Orlando, FL, just 5 minutes from Universal’s Harry Potter World. Swim coach, yo-yo collector, dermatologist, and swim enthusiast extraordinaire Lucky Meisenheimer opens his lake front home every morning to allow swimmers of all ages to enjoy the spectacular swim venue. I found out about this swim through a post on the Marathon Swimmers Forum and the group members were very helpful in answering my questions on Facebook. I have never seen anything quite like the set up at Lucky’s. My mom and I arrived at the property and followed the signs past Luckys house and down to the water front. Walking in at 7:15, we were early for the 7:45 swim, yet were greeted by a smiling swimmer in a swim shack on the dock. I signed a waiver and was given instructions for how to complete the 1000m clockwise crossing. I watched as the man dumped fish food into the lake and a school of about 20 3-foot-long carp came out from under the dock and swarmed the flakes of food. The word welcoming doesn’t even begin to describe the attitudes of the regulars who began to arrive soon after I was given my green cap (worn for the first 3 crossings) and my Orange safe swim buoy (required for the first 25 crossings). I was the only first timer and they made a big deal about taking my picture in front of a #1 sign. At exactly 7:45, the group began to wade into the water, past the 2 alligator statues half submerged into the sandy bottom. I followed a few guys in gold caps (meaning they have done 100 crossings) and started to swim along the buoy line toward the other shore. The murky water was a little eerie but a comfortable 71 degrees and I tried to find my rhythm, pulling the orange buoy behind me. The buoy wasn’t as annoying as I thought it would be and I barely noticed the strap around my waist. After the first lap, a swimmer named Peter introduced himself to me and invited me to swim a few more laps with him. I followed him back out into the lake and we swam 4 more laps, for a total swim distance of 5K. Left: Signing the Wall of Fame at Lucky’s Lake Swim. Right: Signing the wall of the White Horse Pub in Dover, UK (Aug, 2017). After the swim, I was invited to come into the house to sign the wall of fame and get my “swag”. I climbed up on a ladder to reach the ceiling and felt like I was back in the White Horse Pub in Dover. They showed me the Olympians that had signed the wall and I saw several names I recognized. Apparently, my 5 crossings is probably the most ever done by a swimmer on their first visit to the lake. Lucky and me celebrating after the swim! nominated for WOWSA Man of The Year and I can’t think of anyone who deserves this recognition more than him. This swim is an incredible experience and should be a part of any swimmers’ trip to Central Florida. I hope I can come back and swim with this awesome group again soon! Thanks to Lucky and the whole group for making me feel welcome and safe in a new environment. This entry was posted in Uncategorized on November 23, 2017 by abbygirlrose.